Preheat oven to 400 degrees F (200 degrees C). Lightly grease two 12 cup muffin pans, or line with paper baking cups. In a medium bowl, mix the flour, baking soda, baking powder, cinnamon and salt. Blend into the egg and pumpkin mixture. Fold in the chocolate chips. Transfer to the muffin pans. Bake in the preheated oven 15 to 20 minutes, or until a toothpick inserted in the center comes out clean. Remove muffins from pans, and cool on a wire rack. These muffins tasted like that weird feeling you get when you run into a good school friend on summer break at the beach. All of your experiences with that friend occur in the context of studying, coffee shops, and sneakers. You almost don’t recognize her now, sprawled on a beach towel in a bathing suit. This is how I felt about pumpkin…in May. I’m fond of pumpkin, but all of my dealings with the fregetable (is it a fruit or a vegetable? I never know..) have been in the chillier months. It is the one food I have probably always eaten in season without meaning to. Whether its in a bread, a soup, or a pie, pumpkin has always occurred in the context of burrowing in blankets, the great indoors, and mittens. So, to eat my pumpkin muffin, after being forced out of my sweltering kitchen onto the slightly less sweltering front porch with nary a mitten in sight, was disconcerting. 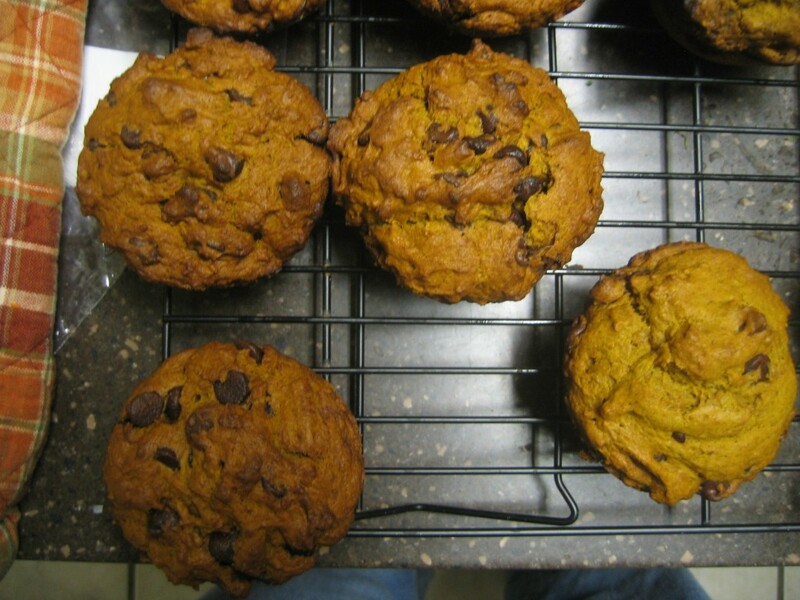 Once I recovered from my surprise, however, the pumpkin chip muffin and I got on quite well. They were blissful right out of the oven. (What muffins aren’t?) The next day they were even better, as the flavors had melded. And there was no danger of the chocolate chips burning my tongue. We ate them as quick snacks or as breakfast. They are quite good toasted with a pat of butter. I never counted the number of muffins left throughout the week, out of fear of being disappointed. As I suspected, they were gone much sooner than they should have been. I like chocolate, and muffins. And these were very good. Posted in Recipes 9 years, 11 months ago at 5:03 pm. What a talent you have !!! Your photography, your writing, and your recipes. A wonderful combination. Thank you for sharing.